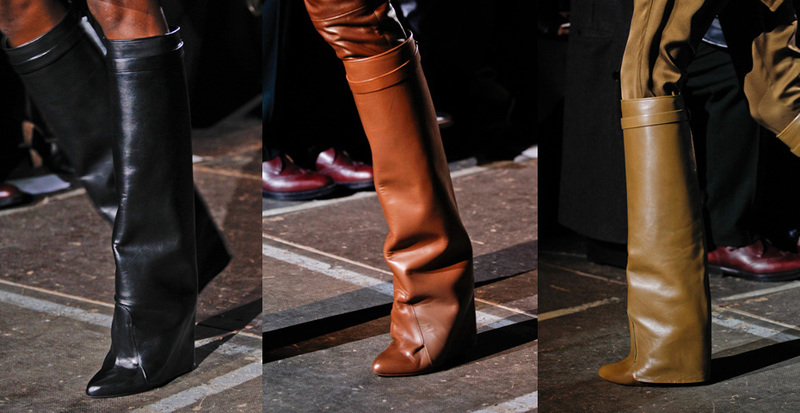 The sleek loook of the Givenchy boot collection for fall is nothing short of spectacular. These riding boots are so lovely I don't think any rider would want to risk damaging them by actually riding. Instead pair them with equestrian inspired looks or even with a beautifully tailored suit or evening dress. Some stars have already been seen wearing these. Lala Anthony was wearing them with denim shorts at an event. Personally I like the look more dressed up as they are in the looks pictured above. The Fold-over look was all over Givenchy runway for the fall season.